The Project is funded by the Global Environment Facility (GEF), implemented by the World Bank and executed by the Organisation of American States. 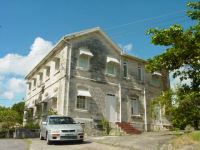 The project is coordinated in the Caribbean through the Regional Project Implementation Unit (RPIU), which was established by the UWI Centre for Environment and Development (UWICED). A Policy Advisory Committee chaired by CARICOM, provides overall guidance for implementation of activities. 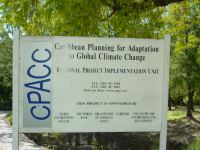 The project's overall objective is to support Caribbean countries in preparing to cope with the adverse effects of global climate change (GCC), particularly sea level rise, in coastal and marine areas through vulnerability assessment, adaptation planning, and capacity building linked to adaptation planning. More specifically, the project will assist national governments and the University of the West Indies Centre for Environment and Development (UWICED) to: (i) strengthen the regional capability for monitoring and analyzing climate and sea level dynamics and trends, seeking to determine the immediate and potential impacts of GCC; (ii) identify areas particularly vulnerable to the adverse effects of climate change and sea level rise; (iii) develop an integrated management and planning framework for cost-effective response and adaptation to the impacts of GCC on coastal and marine areas; (iv) enhance regional and national capabilities for preparing for the advent of GCC through institutional strengthening and human resource development; and (v) identify and assess policy options and instruments that may help initiate the implementation of a long-term program of adaptation to GCC in vulnerable coastal areas. Design and Establishment of Sea Level/Climate Monitoring Network. Coral Reef Monitoring for Climate Change. Coastal Vulnerability and Risk Assessment. Inventory of Coastal Resources and Uses.